If you’ve been a long time Macheesmo reader (thanks!) then you probably know that one thing I disliked about my cooking setup in DC was that no-grill situation. I had no space for a grill and it drove me crazy. It was one of my top priorities to snag a snazzy grill when I moved to Colorado. These rants did not fall on deaf ears and my loving mother and mother-in-law pitched in to get us a really nice gas grill. And if you think for a second that I’m just not going to grill because it’s December well then you have a new thing comin’! Now. Some people might be a bit disappointed that the first grilled thing I’m choosing to post on Macheesmo is tofu, and so let me just address that right away. 1) The first thing I grilled was actually steak. I couldn’t think of a better way to break-in a grill. 2) Tofu is delicious so just get over it. 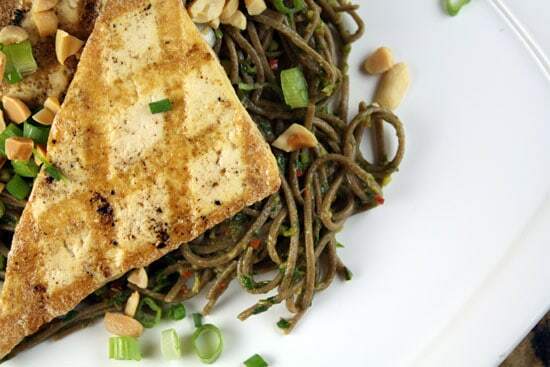 A spicy pesto mixed with buckwheat noodles and topped with sesame oil grilled tofu. 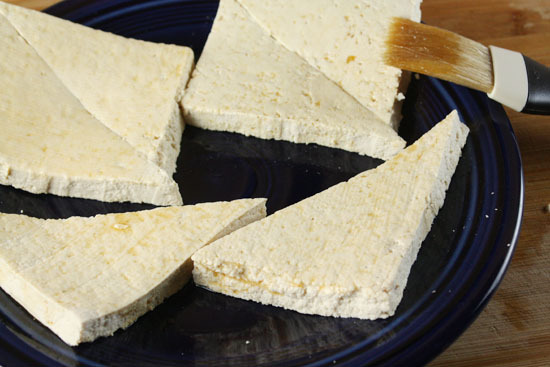 1 pound extra firm tofu, pressed and cut into 6-8 triangles. 1 red jalapeno pepper (doesn't have to be red). You could use any number of chilis for this. 1) Press tofu under a flat surface with a bit of weight to press out some of the water. Then slice tofu into triangle pieces that work well for grilling. 2) Brush tofu with sesame oil and set aside until ready to grill. 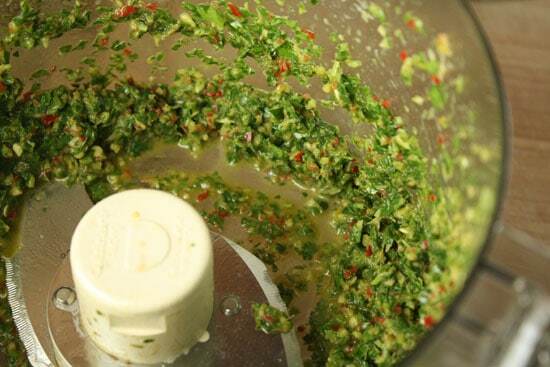 3) Combine pesto ingredients into a food processor and pulse until a paste. If you don’t have a food processor, you can mince all the ingredients well and stir together. 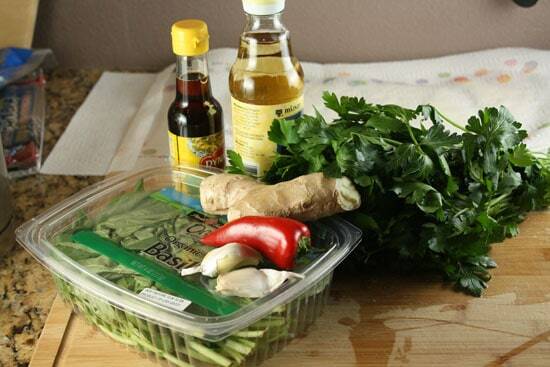 4) Cook soba noodles according to package and then drain and toss with pesto. 5) Grill tofu over medium-high heat for 6 minutes a side, turning 90 degrees halfway through to make criss-cross marks. 6) Serve tofu over soba noodles. This is kind of a modern, Asian slant on pesto. 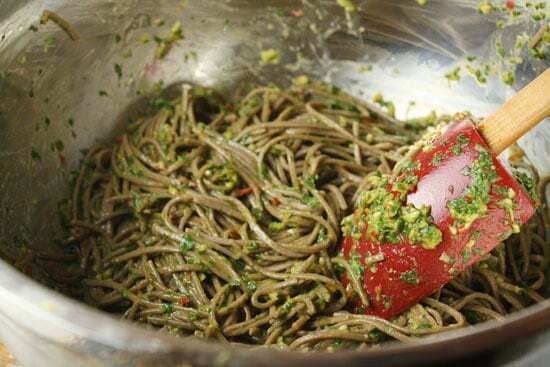 I’m not even sure if it’s cool to call it pesto, but that’s what I’m calling it because it’s just a few things mixed into a paste basically and served over noodles. If you have a food processor, you can just minimally chop the herbs and stuff and then toss them all in the processor for a few quick pulses. If you don’t, then make sure you mince all your ingredients really well. The last thing you want is a big chuck of pepper or garlic in with your soba. It should be a pretty even texture. Add in the oils and vinegar near the end. The little bit of liquid helps bring the pesto together. 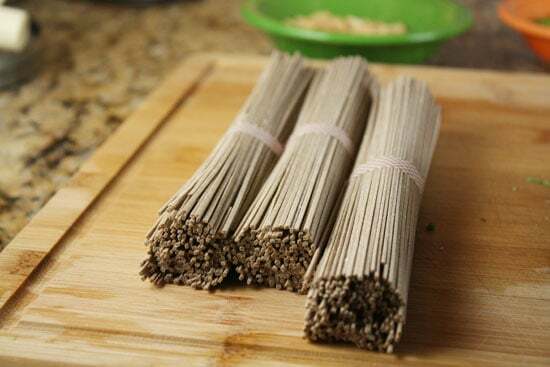 If you’ve never cooked with soba, I’d really encourage you to give it a shot. If you can make spaghetti, then you can make soba. The only difference is the flavor. While spaghetti can be a bit bland, soba has a fantastic flavor on its own. It’s a bit nutty and is fantastic with the other flavors in this dish. Just cook the soba according to the package. Be sure not to overcook it or it’ll get really mushy. When it’s done, drain it and then immediately toss it with all the pesto. This is a pasta that’s great hot or cold and makes awesome leftovers the next day. This might shock you, but tofu is actually really easy to grill. There’s no need to worry about cooking it all the way through or anything like that. Basically, all you’re looking for is to heat it up, get some nice grill marks on it, and infuse some nice flavor. Anytime you are grilling or pan frying (which you can do for this recipe if you don’t have a grill), it helps to press the tofu block between a few paper towels with some weight on top to get out a lot of the liquid in the tofu. Then you can chop it up. The only issue with tofu is that it does have a tendency to stick to things. So, I brushed all of my triangles with sesame oil which made them easy to move around on the grill. I turned my grill on medium-high heat and grilled these guys for about 6 minutes a side, turning them 90 degrees at 3 minutes to get some criss-cross marks. 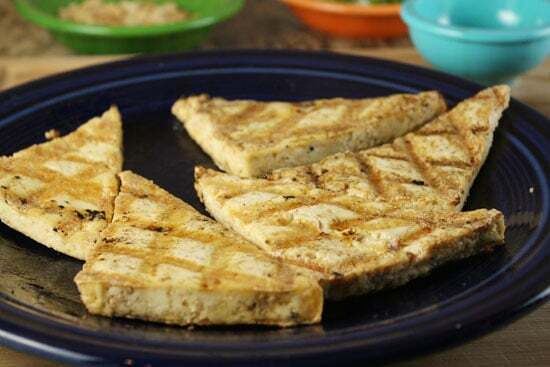 The criss-cross gives the tofu a nice even grilled texture over the whole piece. It also looks good! 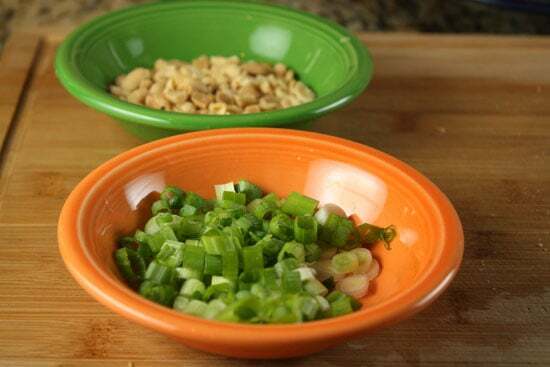 While your noodles are cooking and your tofu is grilling, you can chop up some scallions and peanuts for topping the dish. Then just toss a tofu triangle or two on a big mound of soba and add some garnish if you want. It’s a really healthy dish that’s definitely not lacking in the flavor department. I’M REALLY EXCITED TO HAVE A GRILL. Anybody a grilled tofu fan? Leave a comment! Ha! It was dark but I'll post some in a future post. It's a Weber though. I'm in love with it so far. I'm not a tofu fan, but the soba sounds tasty. I love the fusion pesto, it's an awesome idea. Yay! Grilled tofu- you're speaking my language! The soba looks awesome, too. Never grilled tofu, but I may have to start. Probably not for a couple of months – Michigan winters aren't good for grilling – but it looks delicious, Nick! I wimped out. It's getting down to 9 degrees here tonight and I am cooking inside instead of the grill. Can't wait to see what you unleash on your new Weber. Tofu is indeed delicious. Looks like tasty goodness right there. I love me some soba! 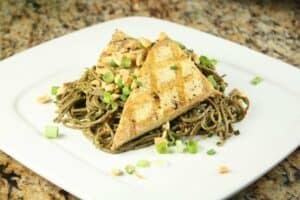 I made a combination of the soba noodles with asian "pesto" last night but used the tofu from the brussel sprouts recipe and it came out delicious! Next time I may cut back on some of the oil. And I used basil and cilantro for the "pesto" instead of parsley.